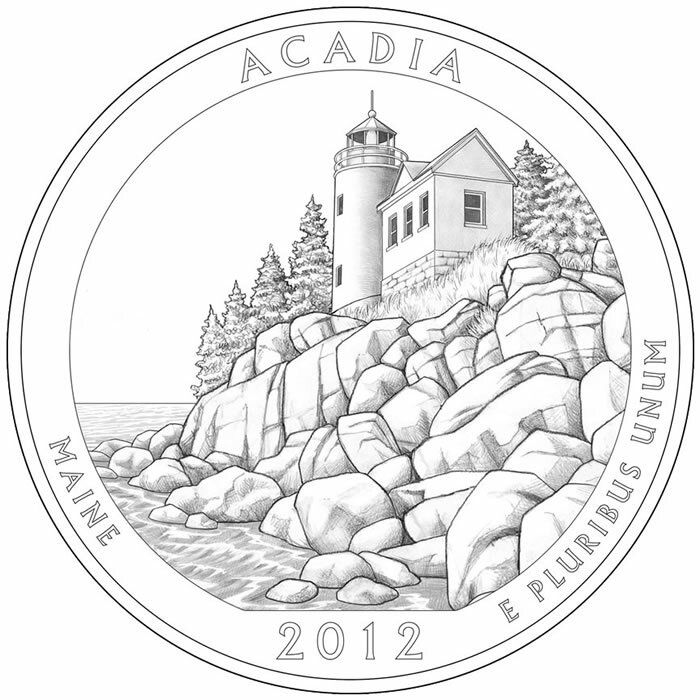 The 2012 National Park Quarters will be issued by the United States Mint as the third annual installment of the America the Beautiful Quarters® Program. 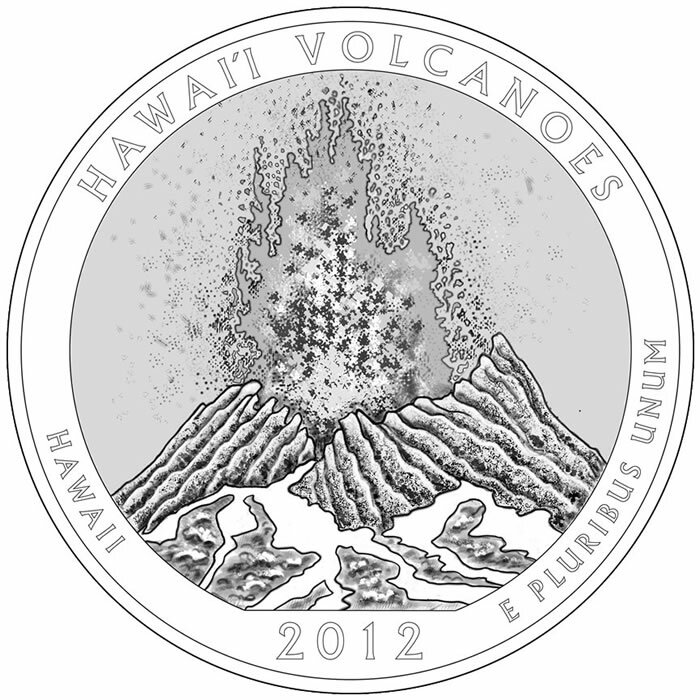 These fives strikes continue the series which honors national parks and other national sites with reverse designs emblematic of the selected locations. They also mark the eleventh through the fifteenth in the series which debuted in 2010. Under the program, the United States Mint will release each quarter based on when the national site was established. For example, the Hot Springs National Park Quarter was the first coin to be featured in the series back in 2010 because the United States took direct control of the area in 1832. Conversely, the Tuskegee Airmen National Historic Site Quarter will be the last coin to be released as this site was only established in 1998. Each site was selected by the Secretary of Treasury Timothy Geithner with the help of the governor or chief executive of each jurisdiction. Secretary of the Interior Kenneth Salazar was also included in the selection process. In keeping with a procedure established decades ago, President George Washington is featured on the obverse of each coin with the inscriptions of UNITED STATES OF AMERICA, QUARTER DOLLAR, LIBERTY and IN GOD WE TRUST. The first President of the United States has been on the quarter since 1932 with this same design as originally completed by John Flanagan. Opposite of George Washington, the national park or site is featured on the reverse along with inscriptions indicating the name of the location, the state or territory where it is located and E PLURIBUS UNUM. The National Park Quarter designs are also featured on five ounce silver bullion coins containing .999 fine silver struck to a three inch diameter. 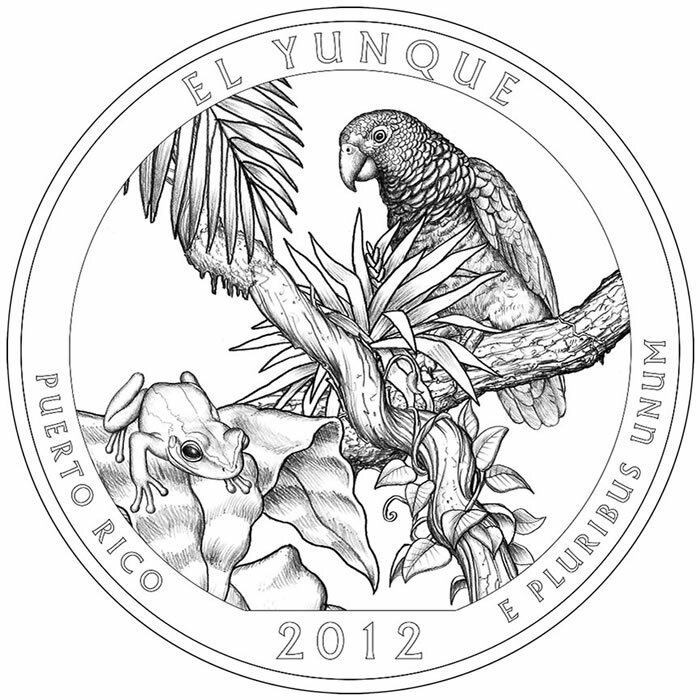 El Yunque National Forest Quarter – The El Yunque National Forest Quarter honors a site in Puerto Rico that is special because it is the sole tropical rain forest featured in the United States National Forest System. Even though the forest is small, it boasts a tropical climate all year long, and an assorted bio system like no other forest in the United States. El Yunque National Forest also contains the Luquillo Mountains. This range rises 3,500 feet above sea level and makes up much of the forest. It has been recorded that these mountains can receive up to 200 inches of rainfall in the higher elevations. 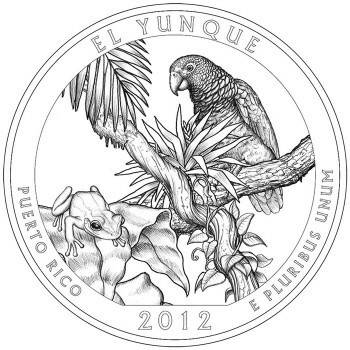 Spaniards may have given the El Yunque National Forest its name when they first visited the island. Many thunderstorms roll through the forest with the thunder said to sound like a hammer hitting an anvil, which is Yunque in Spanish. Others believe the name may have come from the locals that lived on the island who called the area "Yu-ke". 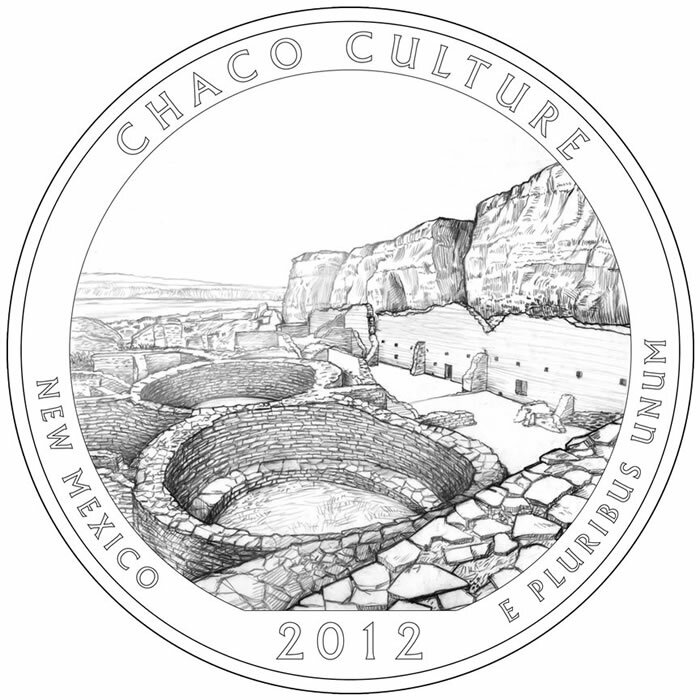 Chaco Culture National Historic Park Quarter — The Chaco Culture National Historical Park Quarter honors the site in New Mexico where, a thousand years ago, a culture of Pueblo people thrived even though the living conditions were difficult. Eventually the residents in this region abandoned the dwellings built here and moved on. No one knows for certain why this occurred. More recently, much of the area was put off-limits to the public due to erosion. The National Park Services is actively working with descendents of the Pueblo people to conserve what remains of the historic structures found there. Release date: April 2, 2012. 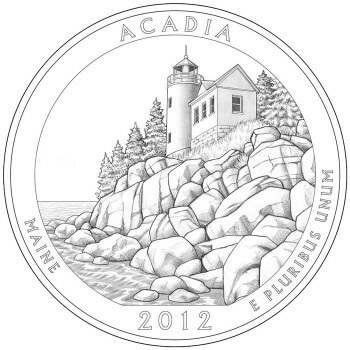 Acadia National Park Quarter — The Acadia National Park Quarter honors a site in Maine where both Native Americans and European settlers have called home. The Native Americans had lived there for centuries before it became one of the first areas to be settled by immigrants from Europe. The park itself was established as Sieur de Monts National Monument on July 8, 1916. Additional protections were added to the area when it became a national park in 1919. Philanthropist John D. Rockefeller, Jr. is largely responsible for the current infrastructure of the park as he personally funded it including miles of carriage trails and several structures. Release date: June 11, 2012. 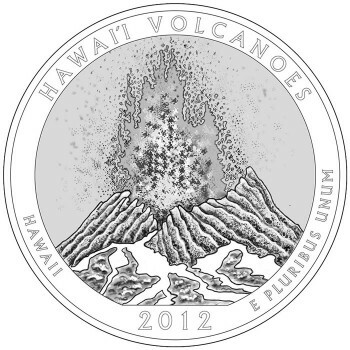 Hawaii Volcanoes National Park Quarter – – Honoring a national park located on the "Big Island", or the island of Hawaii in the state of Hawaii is the Hawaii Volcanoes National Park Quarter. Hundreds of thousands of years of volcanic activity has created this national park, which is still growing today. The volcano known as Kīlauea continues to spew molten lava that expands the size of the island as it flows into the ocean and creates rock. Along with offering an up-close glimpse into an active volcano, the park also provides awareness on how the islands were created. It is also a popular tourist spot, garnering over one million visitors a year. Release date: August 27, 2012. 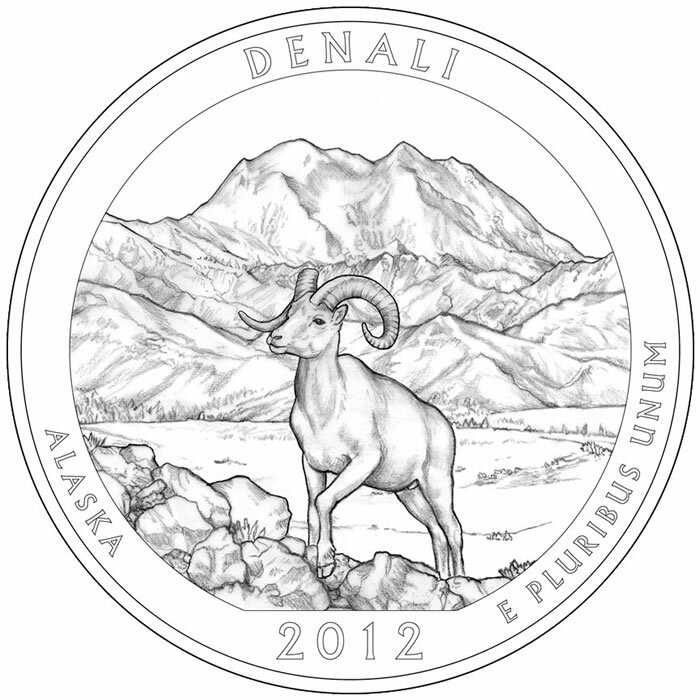 Denali National Park Quarter — The Denali National Park Quarter honors the park located in Alaska featuring Mount McKinley. Mount McKinley is the highest mountain in North America, which fits the name Denali perfectly as it means "the high one". 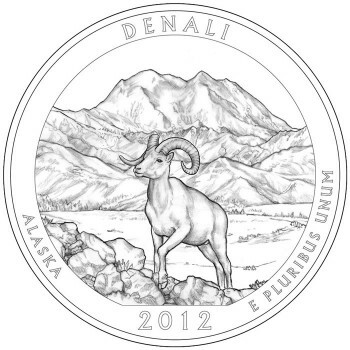 The Denali National Park hosts over one million visitors per year which is amazing when one considers the rugged terrain and location of the park. Only the first 15 miles of the main road within the park is accessible to private vehicles, with the remaining road reserved for concessionary busses. This is probably for the best as only a small portion is paved. Release date: November 5, 2012.